Craig Santos Perez with his second book, and the cover of his first. CRAIG SANTOS PEREZ, a native Chamoru from the Pacific Island of Guahån (Guam), is the co-founder of Achiote Press (www.achiotepress.com) and author of two poetry books: from unincorporated territory [hacha] (Tinfish Press, 2008) and from unincorporated territory [saina] (Omnidawn Publishing, 2010). He received an MFA from the University of San Francisco and is currently a Ph.D. candidate in Comparative Ethnic Studies at the University of California, Berkeley. He blogs at craigsantosperez.wordpress.com. In keeping with our investigation of “The Page As Canvas,” we recently sought the opportunity to speak with Mr. Perez about his strategic use of typography, visual arrangement of words, and maps in his first book, from unincorporated territory [hacha]. Ever gracious, he offered us the insights that follow. LR: How did the idea for the project that is from unincorporated territory come about? CP: My multi-book project, from unincorporated territory, formed through my study of the “long poem”: Pound’s Cantos, Williams’ Paterson, H.D.’s Trilogy, Zukofsky’s “A,” and Olson’s Maximus. I loved how these books were able to attain a breadth and depth of vision and voice. So I began to imagine each book from my own project as a book-length excerpt of a larger project. 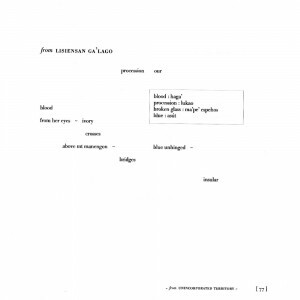 One difference between my project and other “long poems” is that my long poem will always contain the “from,” always eluding the closure of completion. I also became intrigued by how certain poets write trans-book poems: such as Duncan’s “Passages” and Mackey’s “Songs of the Andoumboulou.” I employ this kind of trans-book threading in my own work as poems change and continue across books (for example, excerpts from the poems “from tidelands” and “from aerial roots” appear in both my first and second books). These threaded poems differ from Duncan and Mackey’s work because I resist the linearity of numbering that their work employs. LR: Your first book, from unincorporated territory [hacha], is unique in that it makes use of strategic typography, diagrams, maps, illustrations, and other aspects of its visual design to put forth both its politics and its poetics. What was your process like in developing this visual vocabulary and drafting your writing into its framework? CP: I imagine the blank page as an excerpted ocean filled with vast currents, islands of voices, and profound depths. I imagine the poem forming as a map of this excerpted ocean, tracing the topographies of story, memory, genealogy, and culture. So creating the visual vocabulary of my work is a process of both drafting these word maps and navigating their currents. I use diagrams, maps, and illustrations as a way to foreground the relationship between storytelling, mapping, and navigation. 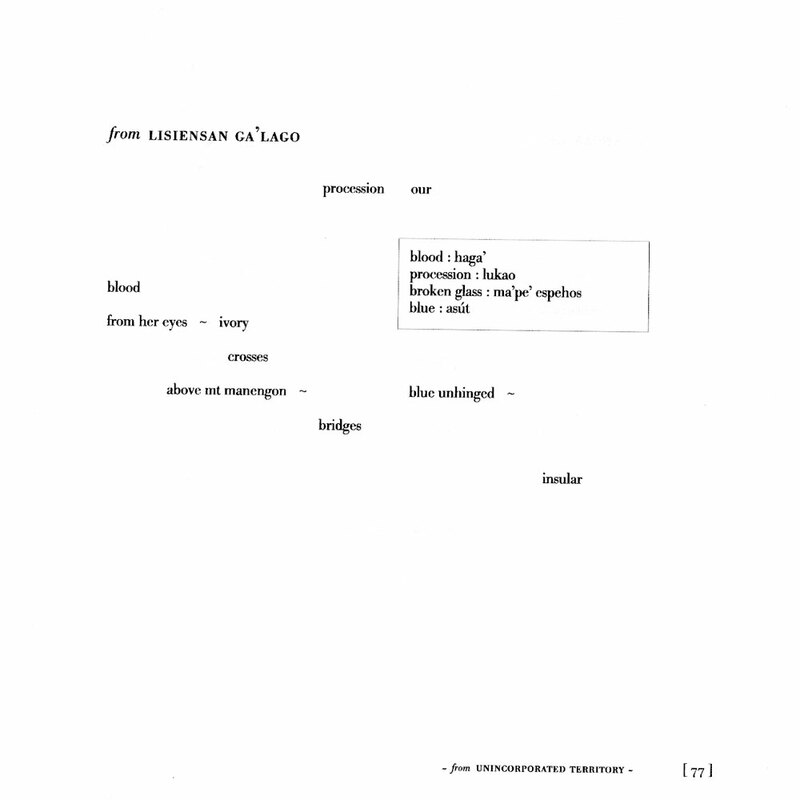 Just as maps have used illustrations (sometimes visual, sometimes typographical), I believe poetry can both enhance and disrupt our visual literacy. One incessant typographical presence throughout my work is the tilde (~). Besides resembling an ocean current and containing the word “tide” in its body, the tilde has many intriguing uses. In languages, the tilde is used to indicate a change of pronunciation. As you know, I use many different kinds of discourse in my work (historical, political, personal, etc) and the tilde is meant to indicate a shift in the discursive poetic frame. In mathematics, the tilde is used to show equivalence (i.e. x~y). Throughout my work, I want to show that personal or familial narratives have an equivalent importance to official historical and political discourses. LR: Can you talk specifically about the importance of maps and mapping (topological, geographic, typographic) within the text? How would you describe the role of the actual maps (of flight plans, military bases, etc.) contained within the text with respect to the greater arc of the work? Do you see them as a genre of visual poem in and of themselves, or as illustrations to the text that surround them? CP: Cartographic representations of the Pacific Ocean developed in Europe at the end of the 15th century, when the Americas were incorporated into maps: the Pacific became a wide empty space separating Asia and America. In European world maps, Europe is placed at the center and “Oceania” is divided into two opposite halves on the margins. As imperialism progressed, every new voyage incorporated new data into new maps. The “actual maps” in my first book are, to me, both visual poems and illustrations of the rest of the work (they were created by designer Sumet (Ben) Viwatmanitsakul, based on maps that I included in my original manuscript). In my imagination, they function in two ways: first, they center “Guam,” a locating signifier often omitted from many maps. Secondly, the maps are meant to provide a counterpoint to the actual stories that are told throughout the book. While maps can locate, chart, and represent (and through this representation tell an abstracted story), they never show us the human voices of a place. I place this abstract, aerial view of “Guam” alongside the more embodied and rooted portraits of place and people (like in the poem “ta(la)ya,” which stories about my grandfather’s experience on Guam during World War II). LR: Your second book, from unincorporated territory [saina], was recently published by Omnidawn. How was the process for the second book similar to, and different from, your process for the first? CP: My second book continues the themes of culture, language, memory, family, and history that were launched in my first book. Like the first book, the second book explores various modes of storytelling, mapping, and navigation. I wrote my first book between 2004-2006, and my second book between 2006-2009. I hope that my craft has improved, sharpened, and expanded. 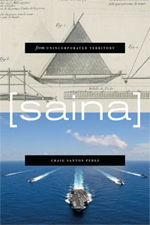 [Saina] more directly explores the themes of militarization and tourism. There’s also a 10-part poem that directly addresses navigation; more specifically, the poem contours the current cultural reclamation project of traditional canoe-building and navigational practices on Guam. [Saina] also contains my most ambitious poem to date, a 50-page work titled “from organic acts,” which stories my grandmother’s experience as a child during the war, her migration to the United States, and her aging in relation to the themes of religion and citizenship. LR: What’s next on the horizon for you? CP: I’ll be traveling for the second book in the next two months: New York this week, Guam after that, then Denver, Seattle, Portland, and Hawaii, with a few readings in the California Bay Area. In the fall, I’ll do an East Coast tour…and possibly make my way to Great Lake states. In terms of poetry, I am in the beginnings of the third book length excerpt of from unincorporated territory. LR: Do you have any words of advice for younger poets? CP: Keep reading, keep writing, keep submitting. One thing that helped me tremendously as a young poet is book reviewing. I couldn’t afford to buy contemporary poetry books, so reviewing allowed me to receive free books. Additionally, engaging with texts sharpened my critical / poetic thinking, which inevitably rubbed off on my creative work. Also, it’s a good way to build up your publication credits and to contribute to the critical discourse. Thanks very much to Craig Perez for sharing his thoughts with us. Look out for a post on Achiote Press’s visual aesthetic next week.